01.What is the difference between physical and chemical water softening treatments? With physical treatment nothing is extracted or added to the water, whereas with chemical treatment substances are added which do not necessarily improve the overall water quality. 02.What does 'Activated Water' mean? 'Activated Water' means that an electrical current causes the minerals present to react forming substances that soften the water. These substances subsequently dissolve. 03.How do you activate the water? The passage of an electric current through the water causes this activation, which lasts up to 600 hours, where as magnetic activation lasts only 6 hours. 04.Why doesn't lime scale form in activated water? Activated water changes the calcium carbonate, the main cause of lime scale, from its calcite form to aragonite. It is this aragonite form of calcium carbonate that cannot stick to surfaces unlike the calcite form. 05.What happens to the calcium carbonate once it is in this aragonite form? 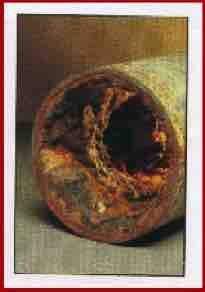 Due to the aragonite not being able to stick to the pipes surface it is swept through the system and down the drain. Therefore, even though there is a reduction in the hardness, it is not at the expense of the boilers/heaters performance. 06.Explain the protective layer being formed over metal pipes by the activated water? Due to the formation of certain compounds from the activation, Fe3O4 is deposited onto iron pipes acting as a protective layer against further lime scale deposits. 07.What does activated water do for hot water equipment? In boilers, for example, the removal and subsequent prevention of lime scale deposits not only increases the performance of the system, it also prolongs its lifetime. 08.List the main advantages of the Revitaliser & Conditioner unit? 100% conversion of calcites to aragonitesVery low energy consumptionLow maintenance costsNo consumables i.e. no softening agents. As water produced is soft, there is reduced need for detergents. Therefore, the system is very environmentally friendly. Long stability time (over 600 hours). 09.How long will it take for existing deposits of lime scale to be removed? This depends on both the thickness of the deposit and the flow-rate through the system. On average approximately 3 - 6 months. 10.How will this removed lime scale be visible? There will be a brownish deposit that will settle to the bottom of the boiler, this will be the remainder of the displaced lime scale, some having been flushed away. This deposit should be removed to ensure performance. 11.How often does your system require servicing? The system is maintenance free, although a check-up 6 months after installation is advised and periodically thereafter. 12.How can we check if the system is working? The lights on the power panel will provide this information. This unit is a unique, physical, non-chemical, water conditioning system giving fully conditioned and revitalised water by Electro-Activation. 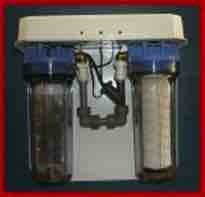 Why use this unit in preference to other water conditioners or softeners?